Crown Lifting: We enter the crown with a rope and harness, then lower to a specified height and remove branches below that height to raise the base of the crown especially for road clearances, driveways and paths. Crown Reduction: We enter the crown with a rope and harness, then climb out onto each branch to reduce the overall size of the tree. The tree is left well balanced for future growth. Crown Thinning: We enter the crown with a rope and harness, then climb out onto branches to remove a set percentage of growth from the crown. Deadwooding: We enter the crown with a rope and harness, then remove any dangerous dead wood, crossing or rubbing branches to allow for a healthy crown. We never use climbing spikes unless felling the tree. Call us for a free quotation. Felling: Cutting the tree to ground level by using a sink cut at the front of the tree to control the direction of fall, then a single precise backcut to bring the tree down in a controlled manner. 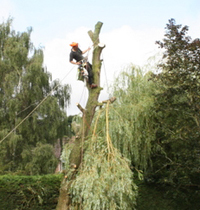 Sectional Felling: We access the crown with a rope and harness, then dismantle the tree by lowering each section on rigging until the whole tree is at ground level. Dangerous Trees: We either access the crown using a rope and harness or with a (MEWP) Mobile Elevated Work Platform and dismantle and lower each section on rigging to ensure the safety of our staff and the environment in restricted areas. To maintain the health of trees we will only ever use climbing spikes when felling a tree. Call us for a free quotation. If your trees are subject to a TPO and/or a Conservation Area Trees and Logs can act as your tree agent and complete the required planning applications. We are happy to meet with the local tree officer before any work is undertaken. Applications for tree works: works to trees subject to a tree preservation order (TPO) and/or notification of proposed works to trees in a conservation area. Town and Country Planning Act 1990. We also work for property developers and are happy to meet with the local tree officer before any work is undertaken. You never know when a tree might blow down or drop a large branch across the road, driveway or even into your house. If the unthinkable happens please call us. We are happy to come out at a moments notice to deal with the aftermath in a safe manner. Trees and Logs take all aspects of health & safety seriously, risk assessment and method statements are produced with every work order undertaken by us and we adhere to the following industry recognized standards.